Enriched with glycerin, the formula improves the skin's ability to retain water and maintain skin hydration. 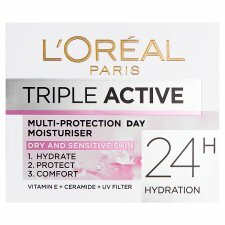 Enriched with Vitamin E and a UV filter, Triple Active helps protect against free radicals and the harmful effects of the sun which contribute to signs of skin ageing. With Ceramide and Vitamin B5, the formula helps reinforce the skin's protective surface and leaves it feeling more comfortable. Immediately the skin is protected against daily stresses to help retain a more youthful appearance. It is intensely hydrated for a feeling of softness and comfort. It regains suppleness and smoothness. The velvety, non-greasy, indulgent texture instantly sinks into the skin. It leaves dry and sensitive skin feeling soft and silky. Use Triple Active every day on a thoroughly cleansed face and neck.